At a meeting of the Society of Psychoneurologists-Materialists in Moscow in 1930, the Chairman of the Society, Aron Zalkind, appraised the current the state of their field in the Soviet Union, and spoke in particular about the work of the Institute of Higher Nervous Activity at the Communist Academy: “here they not only work experimentally,” he said, “but also sometimes philosophize” (Arkhiv Rossiiskoi Akademii Nauk [ARAN], f. 351 op. 2 d. 25 l. 23ob). Such a remark might evoke Monty Python-esque images of a workday never begun, of materials left untouched on tables, as white-robed scientist-philosophers pace about the lab in anticipation of the eureka moment. Coming from Zalkind, however, these were words of praise. Soviet psychoneurologists frequently bemoaned and disparaged what they saw as the naïve empiricism of their Western scientific counterparts, their lack of theory, their reluctance to philosophize. And nowhere was this truer than at the Communist Academy, and its Society of Psychoneurologists-Materialists, formed in 1928 with the express goal of bringing ideological direction to the scientific study of psyche, brain and behavior, and of uniting the work of these sciences into a materialist, dialectical theory of the human. But what was a materialist—let alone dialectical—theory of the psyche? The Soviet Union in this period saw some rather spectacular attempts at reductive explanations of the psyche through correlations in the structures of the brain. Most famously (or notoriously), a group of researchers at the Moscow Brain Institute spent several years cutting Lenin’s brain into thirty thousand little slices in search of the material substrate of his genius, and claimed to find it, at least in part, in an exceptional development of the pyramidal cells of the third layer of the cerebral cortex. 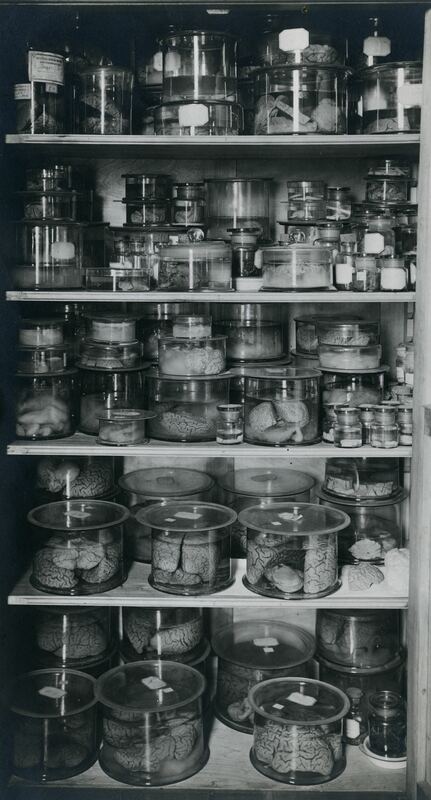 Around the same time, the psychoneurologist Vladimir Bekhterev issued a proposal for a “Pantheon of the USSR,” a Pantheon of Brains, in which the brains of outstanding dead Soviet individuals would be displayed in glass cases, alongside their biographies and list of works, with accompanying diagrams and explanations to demonstrate the correlation between them. Such a Pantheon, Bekhterev suggested, would serve both to advance scientific understanding of the brain and psyche and as “propaganda for the materialist view on the development of creative human activity.” (V. M. Bekhterev, “O sozdanii panteona SSSR,” Izvestiia, June 19, 1927). 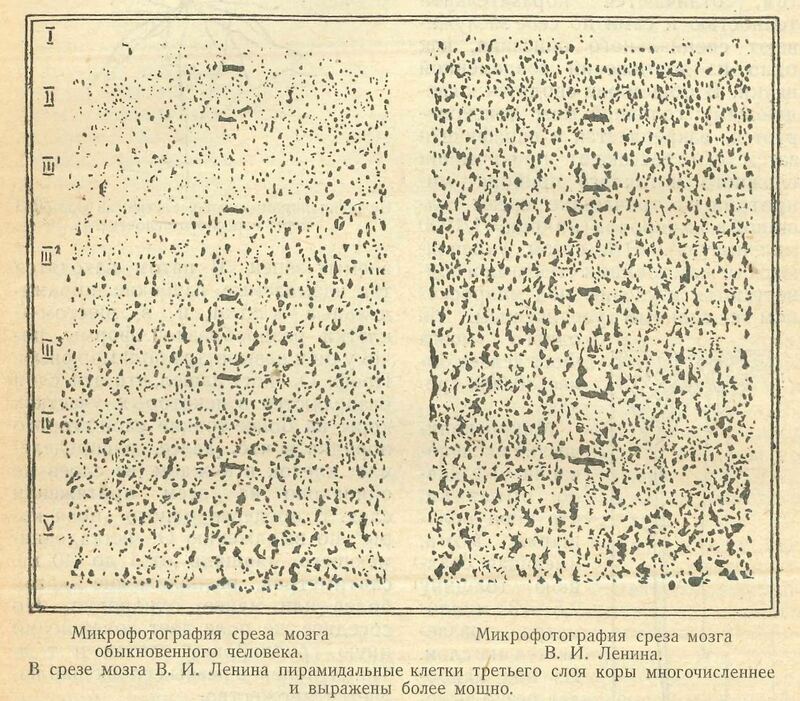 The material substrate of his genius: microphotographs of slices of the brain of Lenin (right) and an “ordinary person” (left). From N. I. Prozorovskii, “Problema anatomicheskoi osnovy odarennosti i mozg V. I. Lenina,” Chelovek i priroda No. 2, 1929, p. 16. The claims made of Lenin’s brain provoked skepticism as well. 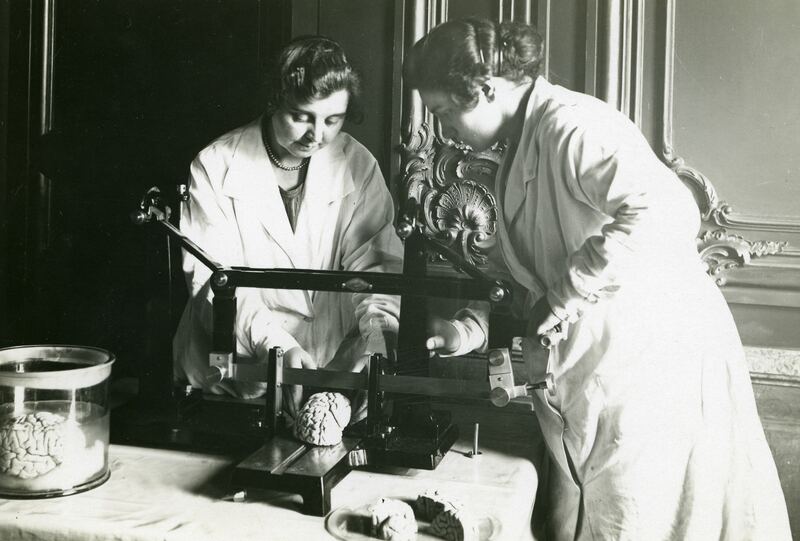 A discussion in the Presidium of the Communist Academy briefly considered whether it might be possible to put the brain back together again to subject it to other methods of study. “They’ve shredded it to smithereens,” one lamented, “the conclusions are negligible, and the brain is lost” (ARAN f. 350 op. 1 d. 188 ll. 36-39). More than mere empirical questions, there were conceptual concerns about the overly “mechanistic” understandings of the psyche that such explanations offered. Where in these big or small cells, to paraphrase one objection, was class consciousness? (ARAN f. 350 op. 1 d. 269 l. 8). Such research might be useful, it was argued, but was in need of ideological direction, a push toward more “dialectics.” They didn’t philosophize enough, it would seem, or they philosophized badly. It was in the context of such concerns that, in late 1928 and early 1929, philosophers, psychologists, physiologists and others came together at the Society of Psychoneurologists-Materialists for a discussion between mechanists and dialecticians on the psychophysical problem. The transcripts remain preserved in the archive of the Communist Academy in Moscow (ARAN f. 350 op. 2 d. 337, 393). They make for dense and at times inscrutable reading; a full exegesis would require volumes. But a brief consideration might provide some insight into what—if anything—came of this meeting of minds and brains. Comrade V. N. Sarab’ianov, a mechanist philosopher, gives the principal paper. Are our thoughts, or ideas, our sensations, he asks, material or not? When Marx says that “being determines consciousness,” does he mean to oppose consciousness to being, in the sense that consciousness is not being, is not objective, spatial, material? Absolutely, as Sarab’ianov affirms: he opposes them. That which in itself is objective, a physical act in the body, Sarab’ianov continues, , is for me subjective, a psychical act. To the disappointment of the reader, he then launches into a long disquisition on primary and secondary qualities, from Locke and Galileo to Plekhanov and Lenin. (Sarab’ianov’s preferred example, fitting for the circumstances, was the quality of red-ness). But his point, in effect, comes to this: subjective phenomena are immaterial and cannot be objectively observed, and the only path to an objective materialist science of the psyche is through what is directly observable in the body and behavior. The dialecticians’ attempts to treat the psyche as “objective being,” Sarab’ianov contends, prove essentially wrong-headed. Does any of this make any sense? Certainly, there is no eureka moment here—or in the discussion that follows—and indeed the prevailing sense is of an immense confusion. The psychophysical problem is not solved. Rather, what we begin to see is that they are in fact posing different questions. At the risk of stretching Frankfurt’s use of the term here (though not, I think, the stakes of a broader intervention), the problem of the brain ‘for-itself’ for the dialecticians was not, in the first instance, a question of matter and sensation, but of the possibility of conscious and purposeful action, of the active role of consciousness, as they liked to say, in human behavior. It was a problem of the place of the psyche in the world. In this respect, we might begin to see how a push towards “dialectics” could point to a different approach to the brain, and to what a materialist explanation of the psyche would be. On one hand, it entailed a turn away from the physical and immediately observable as the privileged form of explaining the psyche: thinking the brain as a thinking thing, the demonstration of “substrates” and “correlates” in itself was of no explanation at all. On the other, it focused attention, above all, on the question of development, and the relation of the brain to the structure of consciousness. Posed in this way, the question to be answered was not one of how the brain produced ideas and sensations, but rather of why, of the role of thought and affect in conscious human activity. In this vein, a number of Soviet psychologists in these years would turn to evidence from the clinic, from child development, and even from socialist construction, to understand the development of specifically human higher psychological functions. As Alexander Luria would later say of the work done in this period by Lev Vygotsky (himself one of the participants in the psychophysical discussion), it was a question of how “history ties new functional knots in the cortex” (Luria, “L. S. Vygotsky and the Problem of Localization of Functions,” p. 391). The fate of that research is a story for another time. The idea here is not that such attempts to rethink the brain came out of this one discussion, or even that they had much to do with dialectics as we might understand it. Rather, it is to consider how such attempts at “ideological direction” may have raised significant questions about what it is we can see, and what it is we explain, when we look at the brain—dead or alive. In this respect there is still perhaps some value in not only working experimentally, but also, sometimes, philosophizing. And, just maybe, in thinking historically as well. For lighter fare, join Joy Neumeyer as she takes A Visit to Moscow’s Brain Institute to explore what’s left of the Pantheon in a delightful article for Vice.